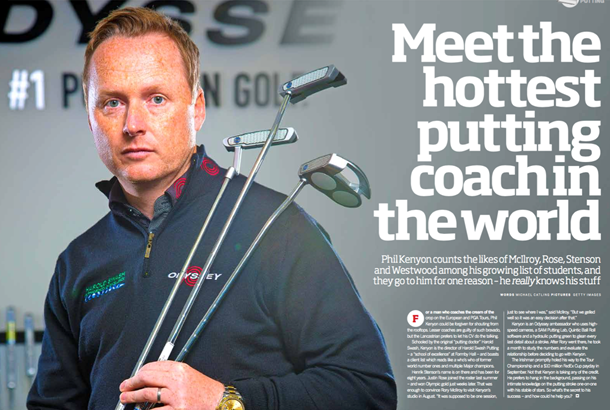 Phil Kenyon counts the likes of McIlroy, Rose, Stenson and Westwood among his growing list of students, and they go to him for one reason – he really knows his stuff. For a man who coaches the cream of the crop on the European and PGA Tours, Kenyon could be forgiven for shouting from the rooftops. Lesser coaches are guilty of such bravado, but the Lancastrian prefers to let his CV do the talking. 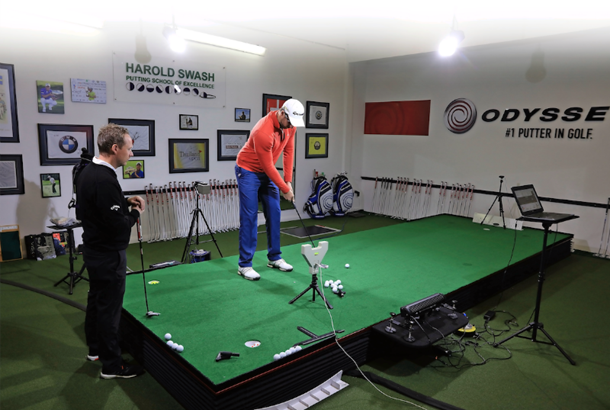 Schooled by the original “putting doctor” Harold Swash, Kenyon is the director of Harold Swash Putting – a “school of excellence” at Formby Hall – and boasts a client list which reads like a who’s who of former world number ones and multiple Major champions. Kenyon is an Odyssey ambassador who uses high- speed cameras, a SAM Putting Lab, Quintic Ball Roll software and a hydraulic putting green to glean every last detail about a stroke. After Rory went there, he took a month to study the numbers and evaluate the relationship before deciding to go with Kenyon. The Irishman promptly holed his way to the Tour Championship and a $10 million FedEx Cup payday in September. Not that Kenyon is taking any of the credit. He prefers to hang in the background, passing on his intimate knowledge on the putting stroke one-on-one with his stable of stars. So what’s the secret to his success – and how could he help you? I was exposed to coaching at an early age and I learned a massive amount from Harold Swash [who coached many of Europe’s great players including Nick Faldo, Padraig Harrington, Darren Clarke and Lee Westwood, and invented the famous Yes! C-Groove putter]. I got to know him as a young boy because he was a good friend of my dad’s. He helped me a lot before and after I turned professional, and I then started teaching on the side to help him out and earn some extra money. When I stopped playing, I was fortunate that he offered me a position to work alongside him. He was at an age when he was slowing down and he was like a mentor to me. If it wasn’t for him, I wouldn’t be doing what I was doing. I always argued that if I didn’t make it as a playing professional, I would get involved in coaching. I graduated with a Masters degree in sports science before I turned pro, and I always enjoyed the teaching side of things. But as a golf fan, sometimes I have to pinch myself that I’m working with players who have won Majors and Olympic medals. It’s very rewarding to see close-hand their marvellous feats and often it doesn’t feel like a job; it’s more like a pastime. The Ryder Cup last year was particularly special, regardless of the result. I had eight players who I work with who made the team. I’ve also been lucky enough to be involved with Henrik [Stenson] and Darren Clarke when they won The Open. As a boy, the Open Championship was always the event you had a putt to win on the practice green. To be fortunate enough to work with two players who’ve won it – and to have been with them during the week – was pretty incredible. I got my PGA status downgraded last year because I didn’t earn enough points. You’ve got to attend a certain amount of seminars and courses to earn points, but my workload was so hectic that I didn’t meet the requirements. Unfortunately, it’s the way the system works, but it hasn’t affected my job professionally. I’ve barely managed to find any time to play this year because I’ve been so busy travelling to tournaments and teaching from my studio at Formby. Integrating science and technology into every lesson is a big part of what we do at Formby. Generally, we try to measure every single aspect of the ball, putter and body. We use SAM PuttLab to measure the kinematics of the putter; a 3D system to measure the movement of the body; Quintic Ball Roll to measure the launch and spin of the ball; and a lot of high-speed videos to create a qualitative measurement of everything. When someone comes here for a lesson, we normally allocate two hours so we can educate them on the best ways to practice. You might assume that an elite player has all the basics nailed, but that’s not always the case. Sometimes it’s very simple things which tour players get wrong. On the whole, though, you are dealing with more minutia and focusing on developing skill sets with elite players, as opposed to gross techniques with amateurs. Teaching a high handicapper is a completely different kind of challenge, but the fundamentals are very much the same. And at the end of the day, it’s still a golf lesson. I’m still trying to get someone to understand the right concepts and coordinate themselves better. The analysis procedure doesn’t change; the only difference is that elite players have a greater adaptability and hand-eye coordination to do what is asked of them quickly and effectively. I have been lucky that I’ve worked with a lot of fantastic putters. But if I had to pick one, David Horsey would probably be up there. I started working with him when he was 18 and his putting wasn’t a particular strength. We’ve now been together for 12 years and it’s been a really nice journey to watch his development. He’s gone on to play in the Walker Cup; won multiple times on the Challenge Tour and the European Tour; and established himself as a really good putter. Matt Fitzpatrick is another one who came to see me as a teenager. We started working together when he was 15 and I think he’s as good as anyone on the green. A large part of putting is mental, but unless you’ve got some decent technique, it doesn’t matter how positive you are. If your club face is open, the ball isn’t starting online. You’ve got to have some resemblance of technical ability before you can start layering in the mental stuff. A golf coach has to do their job first before a psychologist can help to fine-tune things. A lot of tour players tend to use drills which help to calibrate their set-up and the mechanics. Some of the most common are things like mirrors, alignment sticks and elevated string lines. One of my favourite drills I get players to use is a putting gate. It works by placing two tees on your intended start line (just wider than a ball’s width apart) which you have to putt through. Irrespective of your technique, it bridges together the ability to start the ball online, make a good read and control the speed. Putting doesn’t get nowhere the amount of attention it should get. It amazes me how many club golfers don’t have enough lessons – and have never been custom t. The two go hand in hand. There’s a lot of myths about putter fittings and how certain head shapes suit certain strokes, which is largely not true. But length and lie of the putter can affect certain aspects of set-up and technique. Alignment configuration and head shapes can also influence aim, so there’s a lot of aspects to a fitting which play an integral part in any lesson. Sadly, the average golfer doesn’t pay for instruction and ends up buying a putter off the shelf which, in most cases, is ill- fitting. I think a line can be very constraining. The key is to find out what works for you. To improve your putting, you need to understand what you are doing wrong. Then you can get the appropriate x for it. And the only way you can do that is by going for a lesson. The biggest fault I see is too much body movement and too much hand and arm movement, but then every player is different. Ultimately, you’ve got to get help which is relevant to you. Once you’ve done that, it all comes down to the quality of practice. RORY MCILROY: After missing the cut at the US PGA, McIlroy enlisted the help of Kenyon. Two tournaments later and he enjoyed his best putting performance in 16 months, holing six putts between 10 and 20 feet in the third round at the Deutsche Bank Championship. He went on to win the Tour Championship and has finished inside the top 10 in seven consecutive stroke-play events since. JUSTIN ROSE: Since joining forces with Kenyon, the Englishman has won gold at the Rio Olympics and finished runner-up at The Masters. He currently ranks inside the top 75 for strokes gained in putting on the PGA Tour – up more than 60 places versus last year. MATTHEW FITZPATRICK: Labelled a “fantastic putter” by Lee Westwood, the 22-year-old won the DP World Tour Championship in November averaging just 28 putts per round. He currently sits sixth in strokes gained/putting for the 2016/17 PGA Tour season. MARTIN KAYMER: The two-time Major winner averaged 1.54 putts over all four days at Augusta last month. Only two players had a better record. CHRIS WOOD: The defending BMW PGA champion finished inside the top 20 for putts in GIR on the European Tour in 2015 and 2016. Could you play 72 holes in a day?